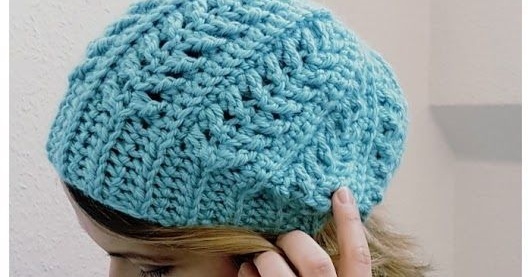 Want the comforting slouch of a beanie without having to make one out of the same old boring pattern as every other beanie? 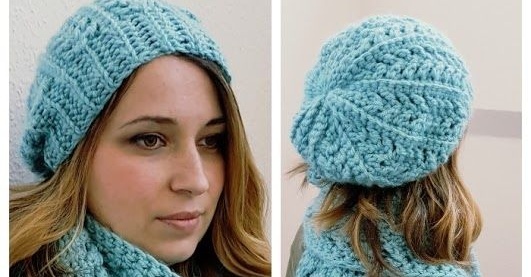 You should try the Go With The Flow Hat, which is made simple by repeating the same four rows, but looks chic and unique due to its special stitches (never fear, there’s a step-by-step photo tutorial for each of them). The gauge should measure around 4 inches for every 10 single crochet stitches. The pattern is sized to fit most adult women but you might want to read the instructions and measure before committing to the wrong fit. 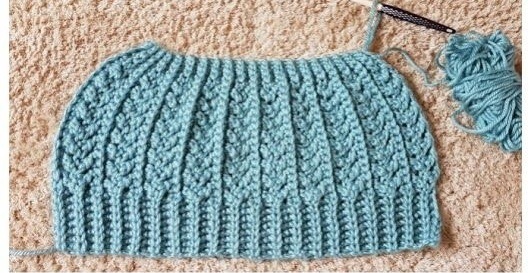 You’ll also need to know the following stitches: chain (ch), back bump of chains (see the included tutorial), single crochet (sc), single crochet in back loop only (sc blo), half double crochet (hdc), double crochet (dc), stitch (st), and back loop only (blo). If you aren’t familiar with the following stitches, there is help available online: yarn over slip stitch (yo-sl st), yarn over slip stitch back loop only (yo-sl st-blo), back cross double crochet (bcr dc), back cross half double crochet (bcr hdc), front cross double crochet (fcr dc), and front cross half double crochet (fcr hdc). Once you’re familiar with these variations on the back loop and double crochet stitches, you’ll have an easy time reading through the pattern. Make sure you look through the photo tutorials and that you’ve got a strong understanding of how each of the stitches work prior to jumping into the pattern to avoid confusion and frustration. The end result, however, is well worth the effort. It’s a soft, breezy, elegant beanie that’s designed to turn heads and keep yours warm! Show off your best stitches and style with the Go With The Flow Hat — and if you’re up for it, you can add an extra challenge and make the Go With The Flow scarf. Of course, if you find yourself wanting to make more of these delectable hats, you can always find someone else to wear your lovely creations. These make great gifts for friends, aunts, moms, grandmothers, teachers, and caretakers. You can adorn each hat with various additions (such as ribbon, buttons, or beads) to make them extra special. You might want to make a bevy of these beanies and present them as gifts during the holidays or for an upcoming excursion. Have some handy and get creative with a variety of patterns, spots, stripes, and colors. 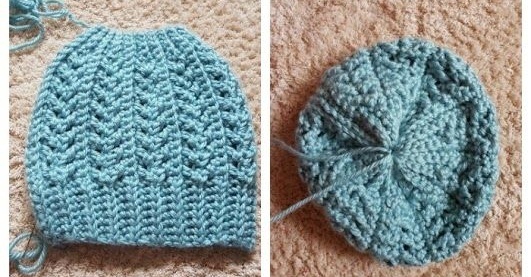 If you’d like to make your own Go With The Flow Hat, you can find the free pattern at My Hobby Is Crochet. Be sure to share a picture of your finished product on the My Hobby Is Crochet Facebook Page, and if you want to pair the hat with the Go With The Flow Scarf, you can find a link to the free pattern on the hat’s instruction page.